Astronomers from the United States and Europe have used a gravitational lens -- a distant, light-bending clump of dark matter -- to make a new estimate of the Hubble constant, which determines the size and age of the universe. A paper describing the work appears in the March issue of The Astrophysical Journal. The Hubble constant has previously been calculated by using NASA's Hubble Space Telescope to look at distant supernovae, and by measurements of the cosmic microwave background -- radiation leftover from the Big Bang, said Chris Fassnacht, associate professor of physics at UC Davis. The new method provides an independent check on the other two, he said. A gravitational lens is a distant object, such as a galaxy surrounded by dark matter, that exerts a gravitational pull on light passing through it. Other galaxies behind the lens, from our point of view, appear distorted. In the case of the object B1608+656, astronomers on Earth see four distorted images of the same background object. Fassnacht began studying B1608+656 as a graduate student a decade ago. Because the mass distribution of the lens is now well understood as a result of recent Hubble Space Telescope observations, it is possible to use it to calculate the Hubble constant, he said. It works something like this. Two photons of light leave the background galaxy at the same time and travel around the lens, their paths distorted in different ways by the gravitational field so that they arrive on Earth at slightly different times. Based on that time delay, it is possible to calculate the distance of the entire route, and then infer the Hubble constant. The timing is set by waiting for a change in the background object -- for example, for it to become more luminous. If the travel times are slightly different, the different images of the background object will seem to brighten at slightly different times. Imagine two drivers leaving Stanford to drive to Davis, one by the East Bay and one through San Francisco, Fassnacht said. Assuming both drivers maintain the exact same speed, they will arrive at Davis at different times. That difference can be used to work out the overall distance. Gravitational lensing has never before been used in such a precise way, said co-author Philip Marshall of the Kavli Institute for Particle Astrophysics and Cosmology (KIPAC) at the U.S. Department of Energy’s SLAC National Accelerator Laboratory and Stanford University. 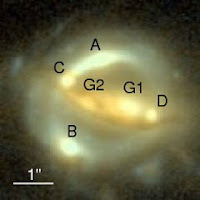 Several groups are now working on extending the technique with other gravitational lenses.